Uglyworld #587 - Mireille's New MP3 Player (152-365), originally uploaded by www.bazpics.com. Babo came with me today to Fry's Electronic store in the neighbouring city of Wilsonville to try and find a new MP3 player to take home for Mireille, Babo decided upon this one as being his favourite as he said from the start, "1Gb is just way to small for all those good musics, and 2Gb is only two times that amount, so 4Gb or more is the target". This little MP3 player has 4Gb of onboard storage capacity with a Micro SD slot to expand it further and comes with a cool full 2.4" colour navigation screen can play video as well as audio. 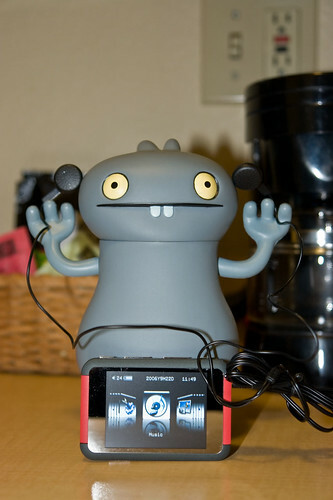 Of course Babo was sure to first call Mireille to let her know that he was opening it up once back in the hotel to make sure it worked ok, so he's been sitting with music blaring for the last hour or so. I tried to tell him he already proved it works, but he said it needs an extended text to "really really prove it!". He can be such a funny little guy at times!